Here again the difficulty is created by assuming that these similar but differing records are identical, without noticing the exact words which are written. It is universally assumed that there was only one, and then follow the efforts to explain the alleged “discrepancies” between the different versions of it. I. Mark 15:26 can be dismissed; for he does not say anything about a “title” (Greek titlos, John 19:19) being put on the cross or anywhere else, which any one had seen. It is a question of the Lord’s “accusation” or “indictment”, or the ground or cause of His condemnation as claiming to be “the King of the Jews”. II. John 19:19 speaks of a “title” written by Pilate, before it left Pilate’s presence; for no one suggests that Pilate went to the scene of the execution and wrote anything there. In Pilate’s writing the three languages were in this order: (1) Hebrew, (2) Greek, and (3) Latin (compare IV. below). And it was read after the cross had been set up. III. The inscription in Matthew 27:37 was the result of that discussion; for another “title” was brought and was “set up over his head”, after they had “parted His garments,” and having sat down, they watched Him there (verses 35, 36). As there could hardly have been two titles at the same time, the former must have been then taken down and the other substituted. We are not told how long the argument lasted or when it ceased, or what was the final result of it.IV. A further result is seen in Luke 23:38; for another was brought much later, close upon “the sixth hour” (verse 44), when the darkness fell. 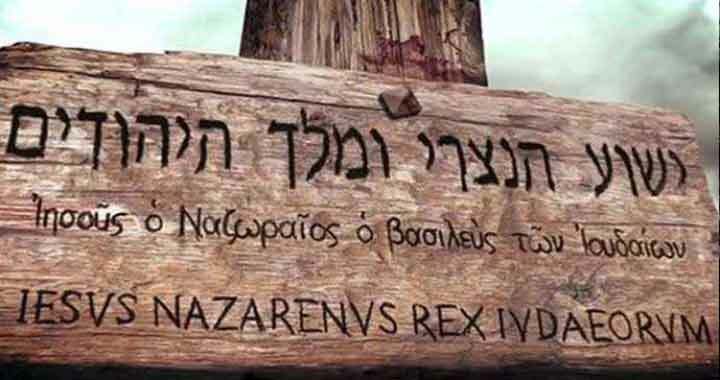 It was written with the languages in a different order: (1) Greek, (2) Latin, and (3) Hebrew (verse 38).¹ It was put up “over Him” (Greek ep‘ auto, verse 38), “after the revilings of the People” (compare verses 35-37, with verse 38); whereas Matthew’s (Number III) was set up before the revilings (compare Matthew 27:37 with verse 39). 1. Mark’s was only His indictment. 2. John’s was the first, written by Pilate himself (or by his order), in (1) Hebrew, (2) Greek, and (3) Latin, and was put on the cross before it left Pilate’s presence. 3. Matthew’s was the second, substituted for the first, in consequence of the arguments which took place, and was set up “over His head” after the garments had been divided, and before the revilings. 4. Luke’s was the third (and last), put up “over Him”, after the revilings (Luke 23:35), and was seen just before the darkness of the “sixth hour” (verse 44). This was written in three languages, but in a different order:¹ (1) Greek, (2) Latin, and (3) Hebrew (verse 38). Not in Hebrew, and Greek, and Latin, as Number II in John 19:19. The following post of his, which probably – and typically – fluctuates between right and wrong, grabbed my interest, nonetheless, for its moving in a direction similar to this present series on Pilate and to some of my recent articles, a favouring of the Greeks over the Romans.